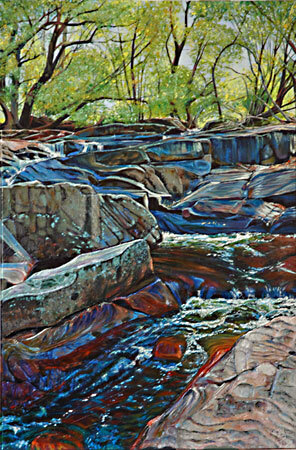 Other waterfall paintings can be seen in Water. 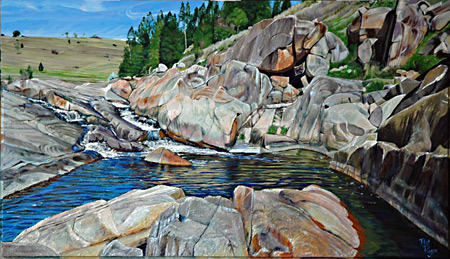 The attraction of this subject is the contrast of the dynamic flow and turbulence of water over a solid rock formation which has also suffered some form of disruptive force to produce the waterfall. Water flow is directed and constrained by the rock but it is also slowly eroding and reshaping the rock via its inherent energy. 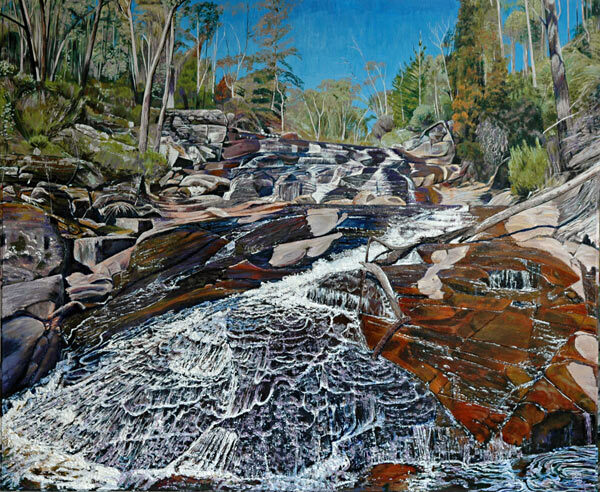 The High Country of southern NSW has some interesting waterfalls due to the dramatic relief produced by the Kosciuszko tectonic uplift. 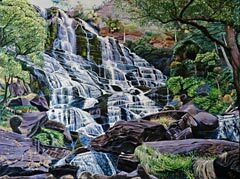 This series will focus on both the well known and lesser known waterfalls of the western Kosciuszko, Tumut, Batlow and Tumbarumba regions. Burra Creek Falls is east of Tumbarumba. It was first documented by the explorers Hume and Hovell on Nov 8, 1824 on their way south to Victoria. It was here that they first saw the Snowy Mountains and decided to turn west after some argument. You can access these falls via the Hume and Hovell Track from the Henry Angel Flat trackhead on Tooma Road. 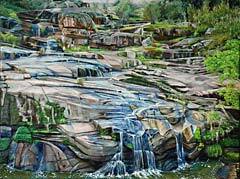 Manjar Falls is situated on private property near China Walls, Maragle NSW. 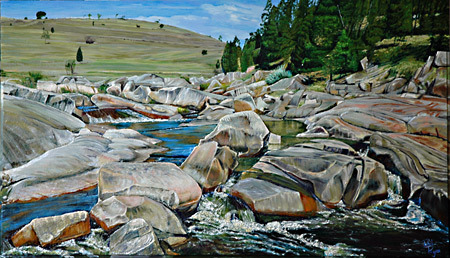 This is granite plateau dissected by streams running into the Tooma River. This area and the falls were the inspiration for Australian author John Marsden in locating his book "Tomorrow When the War Began". Thanks to Lorraine Hurlston for recommending these falls and arranging access. 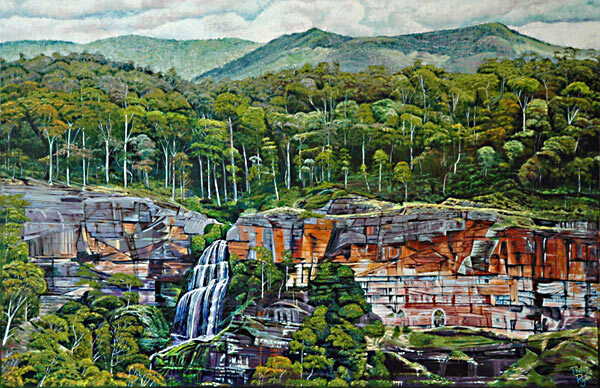 The next 3 paintings are based on photos taken by Harry Hill of Tumut NSW. Harry has trekked across a large part of Kosciuszko National Park and has written extensively on these trips and the regional history. 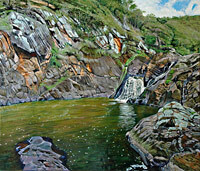 The original photo for "Upper Tumut River Falls" was part of an article written by Harry and published in the Australian Geographic (2000, vol-58, pp 60-71) titled "Down the Tumut". This waterfall is from the upper reaches of the Tumut River near Mt Jagungal. 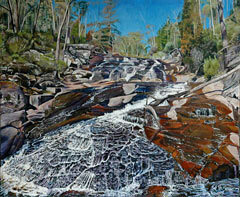 Ryans Creek Falls is part of the Blowering Cliffs which can be seen from my studio at Kunama. This shear rock face is a product of the Lacmalac Fault and forms part of the eastern boundary of Blowering Dam. Harry has written several hiking guides to Kosciuszko National Park which include the hike to Blowering Cliffs and to Milk Shanty Falls. 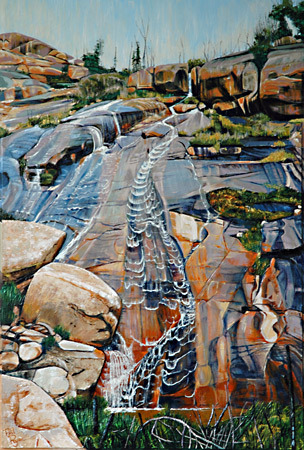 Milk Shanty Falls is one of the most spectacular waterfalls in Kosciuszko but it is also one of the hardest to access. 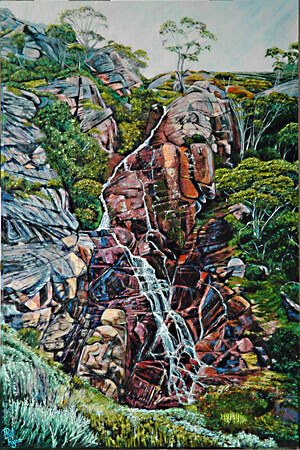 Harry's original photo of this waterfall was printed in his book "Camping and Bushwalking in Northern Kosciuszko National Park" (Envirobook, 2006). 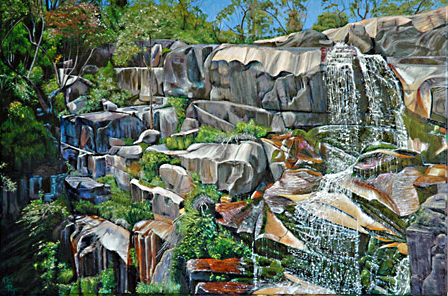 Paddys Rivers Falls is one of Tumbarumba's main tourist attractions and is easily accessed from the Tooma Rd, east of Tumbarumba. 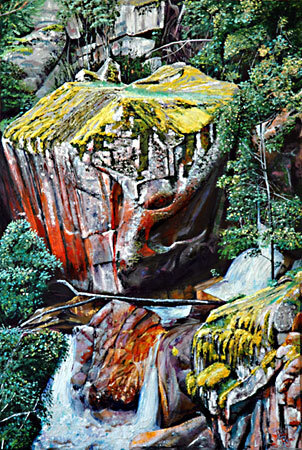 The interesting geology exposed at Paddys River Falls is of a series of basalt lava flows (2 flows are obvious in the painting but there are others below) that flowed down a proto-Paddys River some 24 million years ago. These basalt flows did not fill the old river valley so the modern Paddys River occupies a similar location (at least near the falls) as did the ancient river, although slightly higher in elevation. Buddong Falls is one of the highlights of the Hume and Hovell Track. Buddong Creek rises on the Bago Plateau and flows NE over the Gilmour Fault escarpment to the Tumut River, at the current Jounama Pondage. This is an 800m descent and includes 2 main waterfalls, both of which can be accessed from the Hume and Hovell Track. The explorers Hume and Hovell actually made their ascent of the escarpment on Oct 1824, following a ridge to the north of Buddong Creek- a remarkable feat considering the terrain and their ancillary horses and pack bullocks. 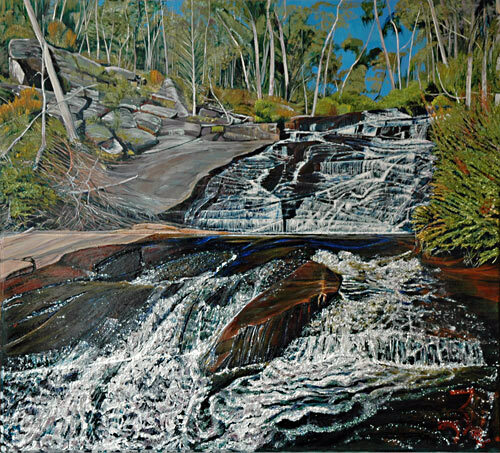 The image of Lower Buddong Falls used for the painting is one of Harry Hills' photos. 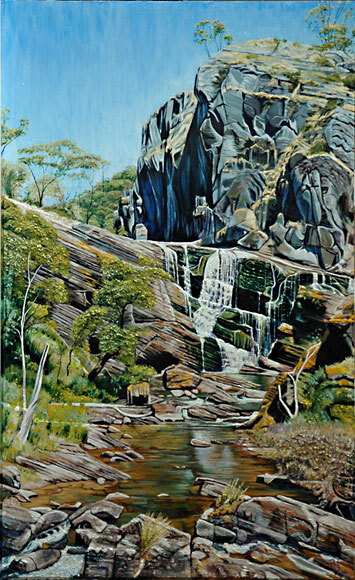 It was originally published in Harry's bushwalking book listed above (in rotated view for some reason) together with a description of the Buddong Falls walk. 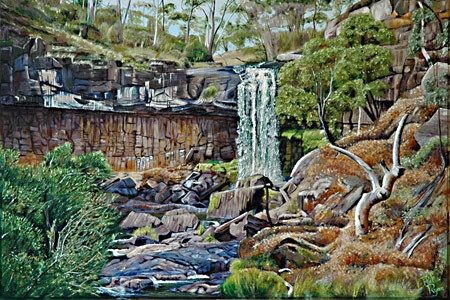 Cave Creek Falls is east of Blue Waterholes and defines the eastern edge the massive limestone outcrop that produced some of the karst features depicted in the Karst Country series of paintings. 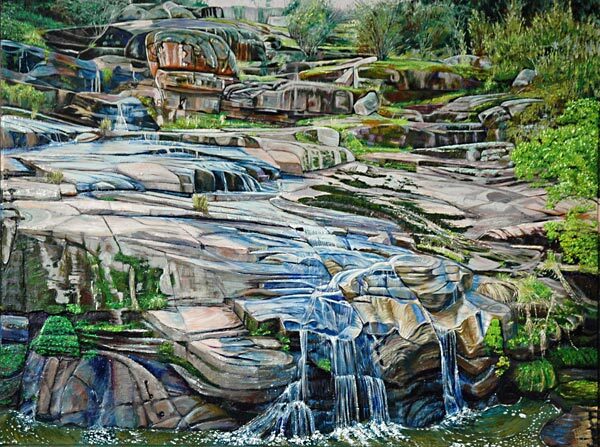 The falls cut through dipping fine sedimentary layers that underlay the massive limestone and this produces the contrasting textures in the rock outcrops of these paintings. Harry Hill provided the 2 photos upon which the paintings were based. 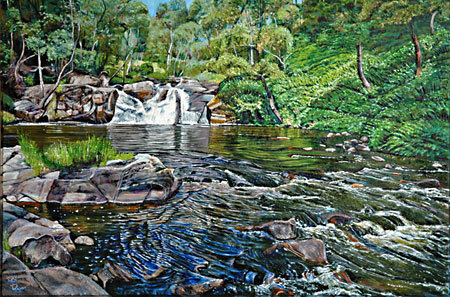 Adelong Falls has played a important role in the European settlement and economic development of the southern tablelands of NSW. Discovery of gold along Adelong Creek in 1852 lead to the exploration of Batlow, Laurel Hill and Tumbarumba gold fields and subsequent town development. 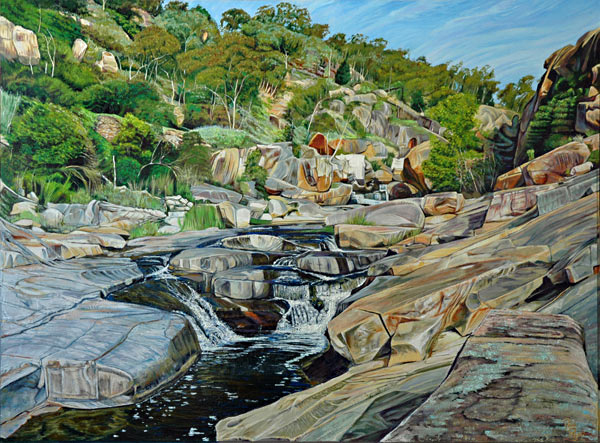 Adelong Falls became the focus of a major gold processing centre with rock crushing and treatment all facilitated by the presence of the waterfalls. The remaining masonry structures of this processing plant are the focus of the Adelong Falls and Gold Mill Reserve. 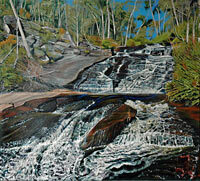 Adelong Falls is the most altered of all the High Country Waterfalls in this series. Yet in a strange way, these human modifications to the landscape, especially the masonary ruins of the old Gold Mill, have been slowly transformed by the geomorphic forces of erosion and time, so that now they seem to be metamorphosing into the landscape. 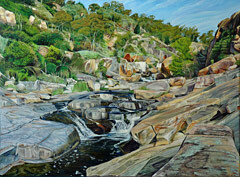 Adelong Falls Trilogy is a 3-part view of the Falls traveling downstream within the Reserve. Downstream from the Reserve is the last major waterfall on Adelong Creek before it meanders west to join the Murrumbidgee River. 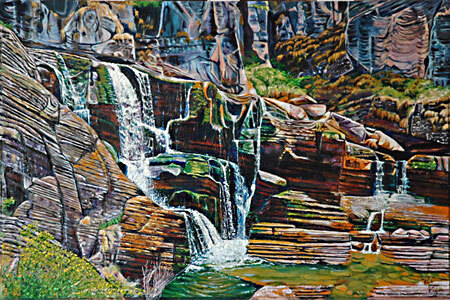 The jointing pattern in the Wondalga granodiorite produces distinctive flatten blocks that characterise this waterfall. Tumbarumba Creek flows north-south, through Tumbarumba township down to the Murray River. Some 25 million years ago there was a similar creek that formed a pathway for basalt lava to flow south from near Laurel Hill, down pass Tumbarumba. This basalt flow blocked the old creek forcing the water to the east or west of the flow to form the current Tumbarumba Creek. McCabes Creek is small tributary to Tumbarumba Creek which flows west across the basalt flow. At the western edge of the basalt flow, McCabes Creek forms a waterfall that exposes the individual basalt flows, the lower with distinctive columnar jointing. This patterning and structure to the basalt waterfall is similar to that seen at Paddys River Falls, although they are separate flows of lava. On Tumbarumba Creek, just south of McCabes Creek, there is a unusual horse-shoe loop in the creek course which is mostly north-south in orientation. 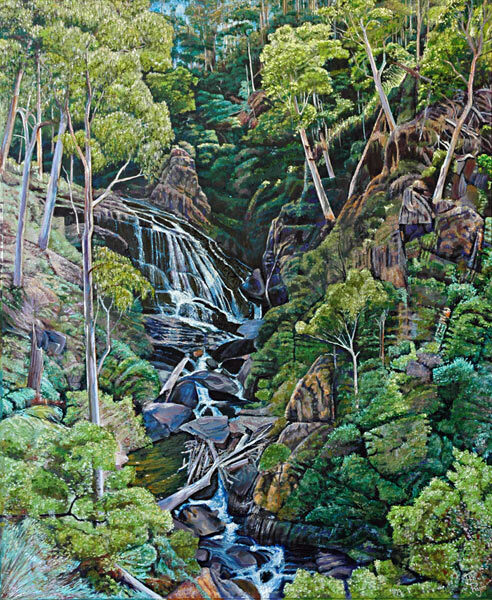 On the southern side of this loop is Tumbarumba Creek Falls. The bedrock under Tumbarumba Creek, since the township, has been Ordovician metasediments which has undergone a lot of tectonic alteration. 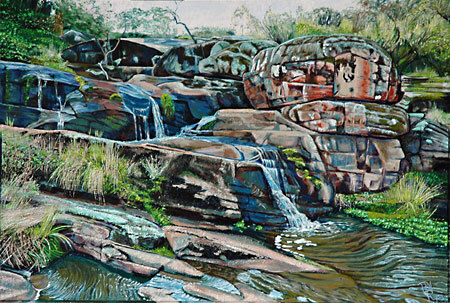 This complex structure is displayed in the form of the falls and adjacent cliffs/rock outcrops, and is in contrast to the simpler McCabes Creek Falls. Thanks to Karen and Geoff Daniels who suggested these two falls and allowed access via their property. 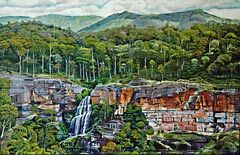 McCabes Creek Falls and Tumbarumba Creek Falls. Three Mile Creek is one of the major streams flowing west out of the Green Hills State Forest pine plantations and into Tarcutta Creek. There are no waterfalls mapped or sign-posted along this creek- I only found out about it by local word-of-mouth. There is actually no single "waterfall" but rather a series of cascades flowing over the exposed Green Hills Granodiorite batholith, which has a series of dome-like outcrops. 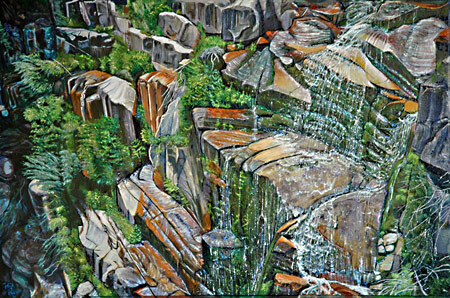 This series of four paintings looks at how the scale of waterfalls can expand as elevation decreases and water's potential energy increases. The granodiorite bedrock produces broad, relatively smooth rock surfaces for the water to flow over and this produces interesting patterns and colours in the cascades. Three Mile Creek Cascades 1, 2, 3 and 4. Gibraltar Falls is one of the largest waterfalls in the ACT. It is situated in the Namadgi National Park, off the Corin Dam Road. The bedrock there is massive rhyolite with strong jointing pattern which allows the rock to have a large prismatic-blocky structure but also readily eroded by the water to curvilinear shapes. 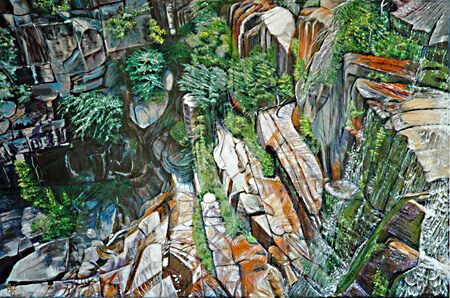 To try to capture the scale and perspective of these falls, I have created a vertical trilogy of paintings depicting the top, middle and bottom of the falls as seen from one vantage point. Gilmore Creek runs to the east of Batlow and flows north into the Tumut and then Murrumbidgee Rivers. 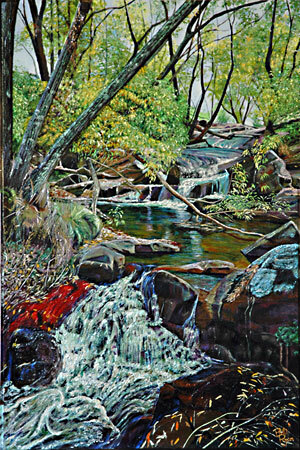 There are several major waterfalls on Gilmore and its tributaries, such as Reedy Flat Creek, that have featured in Batlow's post-settlement history. 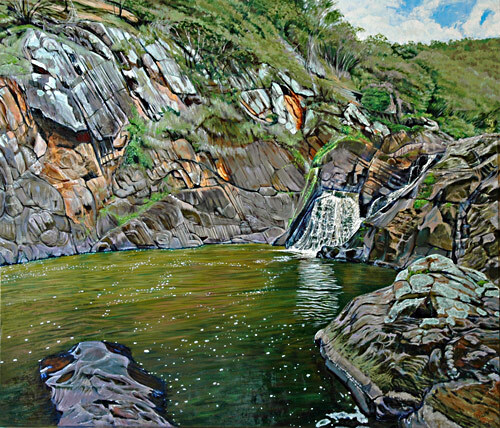 "Big Gilmore Falls" was utilised by the Brown Family of Batlow in 1936 to produce one of the earliest hydro-electrical power plants in NSW. 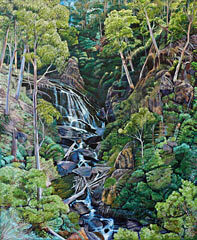 Unfortunately, recent rampant growth of blackberry blocks any access to Big Gilmore or Reedy Flat Creek Falls. There are however smaller waterfalls lower down on Gilmore Creek. One on the Riddell Family property was recommended by John Riddell as an alternative to Big Gilmore Falls. Thanks to John Riddell for access. Mannus Falls is located on Mannus Creek to the south-west of Tumbarumba. 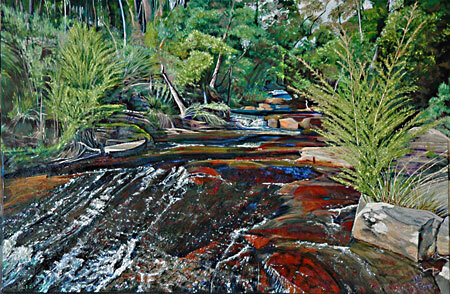 Mannus Falls is well known locally but difficult to access via Mannus State Forest. This is another granite waterfall but this time the Mannus Creek Granite is massive with few orientated fractures or faults (unlike the Wondalga granite at Adelong Falls). Mannus Creek flows south along the boundary between the granite and the older sedimentary rocks. These rocks on the border of the granite have been metamorphosed to produce a indurated bulwark to erosion of Mannus Creek, forcing it to flow south to the Murray River. On Saturday 16th of October 2010, heavy rains caused the wall of the upstream Mannus Dam to collapse, sending a large amount of water and debris down Mannus Creek. 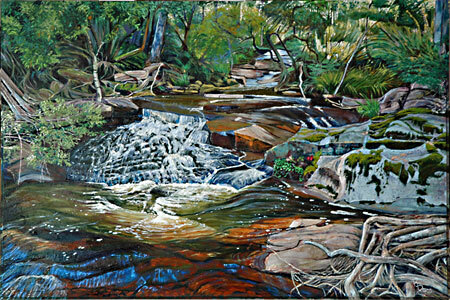 The scouring of Mannus Creek by this event can be seen at Mannus Falls. No problem with encroaching blackberries here. 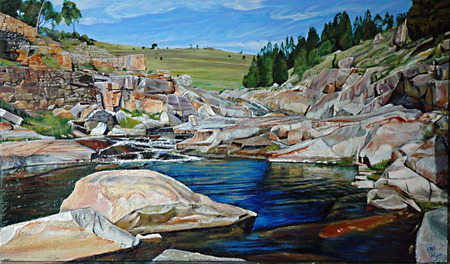 This is the last painting of the High Country Waterfall Series. 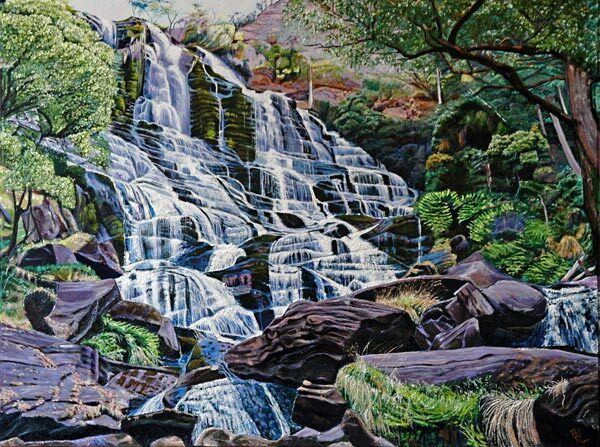 The High Country Waterfalls Exhibition was held at the Tuggeranong Arts Centre in July 2015. More information here.